My kids have always adored broccoli. I know it might be a strange thing to say, but when they were tiny they just couldn’t get enough of it! The trouble was, they went through a phase where they just didn’t want any sort of vegetable that wasn’t broccoli. Even vegetables that used to be acceptable started to be a source of contention at the dinner table. My husband and I also enjoy broccoli, but after a week or so we were starting to feel like we never wanted to see another “little tree” on our dinner table! What finally broke the great vegetable impasse? We started labeling all vegetables in terms of broccoli. Cauliflower was an easy one…we just called it “White Broccoli.” Asparagus was next…what’s for dinner, Mommy? We’re having “Skinny Broccoli,” of course. Peas? “Roly-Poly Broccoli.” Steamed carrots with the tops on became “Broccoli with Orange Trunks.” My kids bought it, and the crisis was averted. They still love broccoli, and (perhaps in part thanks to the story above) I’ve developed a lot of different ways to prepare it. This one is a favorite! Garlicky broccoli with pine nuts is an easy dish to make, and a fun way to avoid the “steam-it-and-serve-it” rut that’s easy to fall into with favorite veggies. Start by slicing some broccoli crowns into thin, wide slices. Just start at one side of the head and cut it into pieces about 1/4 inch thick. You’ll end up with some small florets, some larger pieces, and some interesting large, thin strips. This is a great way to enjoy the whole head of broccoli, because you won’t be wasting the stems. It also helps the broccoli to cook quickly and evenly. You’ll also need fresh garlic, olive oil or melted coconut oil, pine nuts, sea salt and ground black pepper. Slice the garlic into thin pieces. Spread broccoli and garlic on a baking sheet. Drizzle with oil and sprinkle with salt and pepper. Bake in a preheated 425 degree oven for 15 – 20 minutes until the edges start to caramelize. While the broccoli is roasting, heat some oil in a pan on medium heat. Sauté the pine nuts until they become fragrant. Remove from heat. Add to roasted garlic and broccoli and enjoy. Looking for a way to freshen up your broccoli recipes? 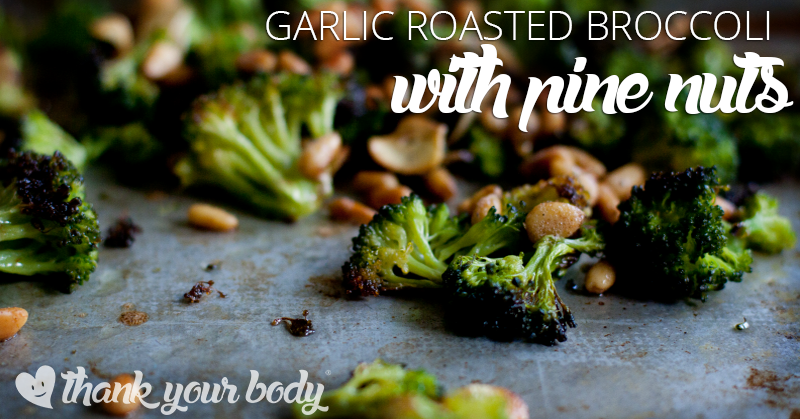 Try this garlic roasted broccoli with pine nuts recipe and you wont be disappointed. Wash the broccoli, and trim about ¼ inch off the very bottom of the stems. Thinly slice the broccoli crowns vertically, starting at one side and working right through the crown. You'll end up with a variety of pieces, from florets to large thin slices. Spread garlic and broccoli on a baking sheet. Drizzle with olive oil and season with salt and pepper. Roast for 15 - 20 minutes until the edges start to caramelize. Heat some oil in a small pan. Sauté for 5 - 7 minutes until nuts become fragrant. Be careful not to let them burn. Add salt and ground black pepper to taste, mix with roasted garlic and broccoli, then serve! Store leftovers in the fridge in a covered container.